What comes to mind when you consider making a recipe of Chili? I am fascinated with the opinions that surround this meal in a bowl. For some of you, it is probably a bit of this and a bit of that, and you are confident the outcome will feed the family. For others of you, perhaps you are loyal to a time-honored family recipe that is now iconic. One group of my friends insists on adding cumin; a different constituency would never even consider including celery. Some households serve Chili over rice, while others consider that sacrilegious. My mind returns to Cold War days in Poland when Chili was a complicated project. First, Larry would have to drive to a village, meet a farmer, select a steer, wait for the farmer to kill and butcher the steer, and then drive huge slabs of beef home in the trunk of our car. The clandestine drive to the village and back to the city meant Larry would arrive home after the children were in bed, and he and I would then labor long hours creating ground beef. We unloaded the car in the garage, and slab-by-slab hauled the would be Chili into our tiny kitchen. Armed with cutting boards and butcher knives, we donned aprons and set to work. Using a small German made food grinder the size of a one-cup measure, my husband and I ground and froze one chunk of fresh meat after another. Arduous, grueling, tiring hours of work stood between us and a bowl of Chili. But we managed. Brown the ground meat with onion, celery, and garlic in a large skillet or Dutch Oven. Afterwards, pour into a crock pot and cook for 6 hours on low. Serve with assorted toppings of cheddar cheese and sour cream. Of course, cornbread is essential, but I will save that for another time. 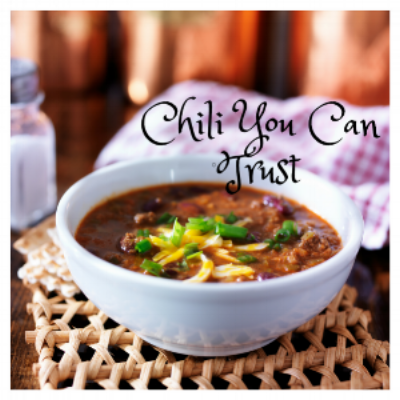 I confidently believe you will enjoy this hearty recipe of Chili. Does your Chili recipe have a history? If so, please share the story with us.